Smooth Radio, the GMG Radio station, is set to launch a targeted marketing campaign to promote the "emotional lift" music can provide, on Monday (14 May). 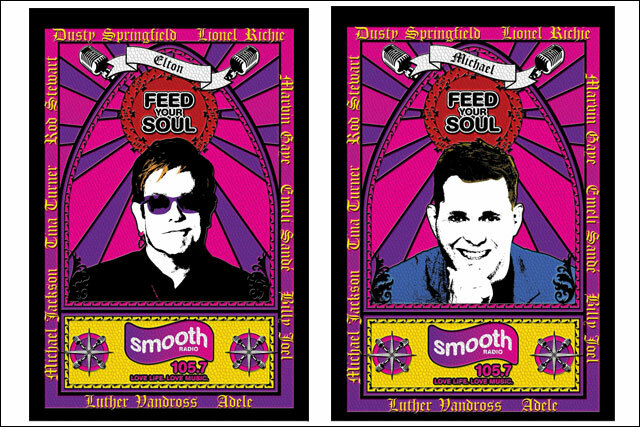 The campaign, created by Arnold KLP with media by MediaCom, uses the tagline 'Feed Your Soul' and features images of artists such as Michael Bublé and Elton John, etched in brightly coloured stained glass. In addition to the 48-sheet and six-sheet outdoor campaign in Birmingham and Manchester, which have been identified as areas in which Smooth has the potential to grow, Smooth Radio will run a competition to win a trip to Las Vegas. To promote the competition, leaflet drops and mobile advertising will drive entries to a special microsite, while the station's new Facebook app will encourage listeners to invite their friends to take part. At Arnold KLP, the copywriter was Andrew Watkinson and the art director was Gary Martin. Stuart Taylor, chief executive of GMG Radio, said: "This campaign is aimed at growing audience in our core 40 to 59-year-old demographic in highly populated cities, where we know there is huge potential to add to Smooth Radio's existing 3.2 million weekly listeners. "The creative is visually striking and our Facebook and mobile activity will drive new traffic to our digital platforms, enabling target listeners to truly engage with the Smooth Radio brand and explore what it has to offer." In addition to the 'Feed Your Soul' tagline and the Smooth logo, the outdoor ads feature the names of artists played on Smooth Radio, including Tina Turner, Luther Vandross, Rod Stewart, Lionel Richie and Adele. Gillian Arthur, director at Arnold KLP, which has held the account since 2010, said "Whenever we conduct consumer research, we are always struck by how contented Smooth Radio listeners seem to be versus non-listeners. "We all know that music gives us a lift and can make us feel better and this insight has led us to the 'Feed Your Soul' campaign for Smooth." Previous campaigns from Smooth Radio include a search for brand ambassadors, who then featured in subsequent ad campaigns, and the promotion of Smooth Radio breakfast DJ Simon Bates.